Semiotics for information design: a study of 2016 olympic pictograms. Design de informação e cidade: um exercício embrionário tendo Brasília como cenário. The metaverse usability: contributions to human interactions and in interactions of individuals with educational contents and activities. Fotocompositora Photon: um exemplo de inovação tecnológica na indústria gráfica. Photon Phototypesetter, an example of technological innovation in the printing industry. An experimental study of the communicative functionality of dynamic images in electronics products manuals. Relação entre o design emocional e a teoria da aprendizagem: ferramentas para o estudo da interação da criança com o brinquedo. Relationship Between the emotional design end learning theory : Tools for the Study of Children''s Interaction with the toy. Construção de sonda cultural: aspectos emocionais na percepção de qualidade do vinho brasileiro. Applying Nielsen’s heuristics in augmentative and alternative communication devices for autistics. Análise dos aspectos gráficos do Jornal Vanguarda. Velhas lembranças, memórias de vida. Memories, an eye to the pursuit of life. Design Interfaces Applied to Inclusive Education. Símbolos de uma vida criminosa: Identidades desveladas em tatuagens. Brand identity based on experience and emotion. The use of design thinking method in the development of interdisciplinary projects the course of technology degree in Public Management. The information hierarchy as a tool for facilitating user navigation in online learning platforms - Case study: My English Online. Visualization on social networks data. Écom prazer que apresentamos os Anais do 7º CIDI | Congresso Internacional de Design da Informação, edição 2015 e do 7ºCONGIC | Congresso Nacional de Iniciação Científica em Design da Informação. Estes são eventos científicos com periodicidade bienal promovidos pela SBDI – Sociedade Brasileira de Design da Informação. A realização conjunta destes eventos proporciona uma profícua oportunidade de intercâmbio entre pesquisadores, profissionais e estudantes do Brasil e do exterior. 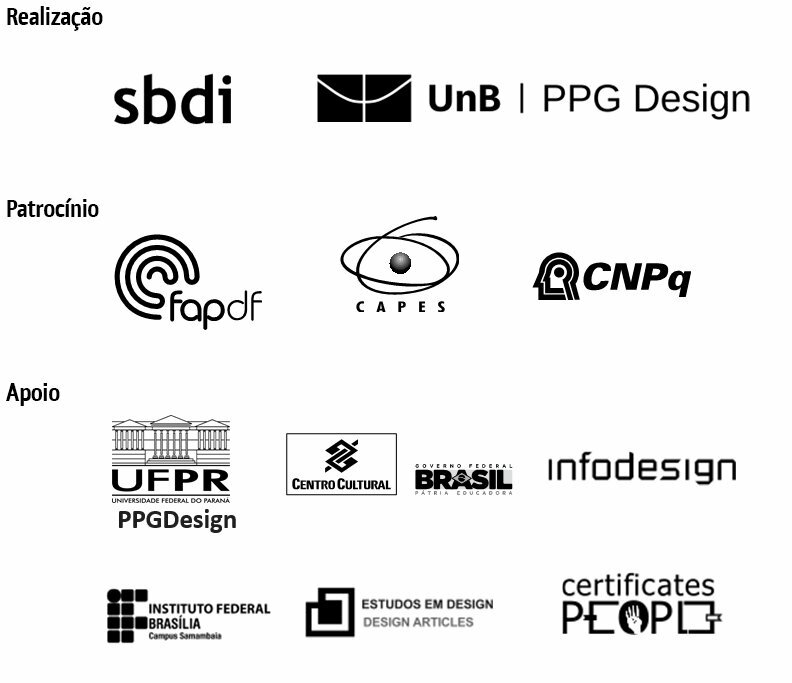 A 7ª edição dos eventos em 2015 foi organizada pela SBDI em conjunto com a UnB - Universidade de Brasília: PPGDesign e Departamento de Design de 2 a 5 de setembro de 2015 no CCBB - Centro Cultural do Banco do Brasil. ASBDI é uma entidade científica que congrega pesquisadores, docentes e profissionais, que atuam em sistemas de informação e comunicação analógicos e digitais, na gestão e produção da informação no Brasil. Dentre as missões da SBDI, encontra-se a de contribuir para o desenvolvimento, organização e difusão científica do Design da Informação enquanto área acadêmico-científica em âmbito nacional e internacional, promovendo e facilitando a cooperação entre profissionais, docentes e pesquisadores, e fomentando o interesse de estudantes pela área, contribuindo, assim, para sua formação profissional e intelectual. Teoria e História: Abordagens/contribuições históricas e teóricas ao design da informação. Pesquisas sobre pioneiros e primórdios do design da informação, propostas de taxonomias, assim como modelos e métodos para seu estudo, enquadram-se neste eixo temático. We are pleased to present the Proceedings of the 7th CIDI | Information Design International Conference 2015 and the 7th CONGIC | Information Design Student Conference. These are scientific events promoted every two years by SBDI - Brazilian Society of Information Design. The combination of these events provides a useful opportunity to exchange among researchers, professionals and students from Brazil and abroad. The 7th edition of the event in 2015 was organized by SBDI together with UnB- University of Brasilia: PPGDesign and Department of Design September, 2 to 5, 2015 at the CCBB - Cultural Centre of the Bank of Brazil. The SBDI is a scientific organization that brings together researchers, teachers and professionals working in analog and digital information and communication systems, management and information production in Brazil. Among the missions of SBDI, is to contribute to the development, organization and scientific diffusion of Information Design as academic-scientific field at the national and international levels, promoting and facilitating cooperation between professionals, teachers and researchers, and fostering interest of students for the area, thus contributing to their professional and intellectual formation. Communication: aspects and issues regarding the effectiveness of information systems in communicating messages, with research focusing on health communication, instructional design, forms, signage, wayfinding/wayshowing systems, graphical symbols, maps and data visualization. Education: aspects and issues regarding the role of information design in education, with studies concerning information design programmes for higher education, educational artifacts, methods and approaches for teaching and learning within an information design perspective. Society: aspects and issues of information design regarding the use of artifacts by individuals and/or their effects on society, including research topics such as social design, vernacular design, health design artifacts for people, and semiotics related to information design. Technology: aspects and issues of information design related to the production and use of technology by individuals, including investigations on human-computer interaction, hypermedia design, game design, augmented reality, animation, wayfinding/wayshowing information, broadcasting design, information design health and the evaluation of digital interfaces. Theory andHistory: historical and/or theoretical approaches and contributions to information design, including research on early information design and designers, proposals of taxonomies, frameworks and models. We wish you all a good reading!